Our used Swift Challenger 580 AL is shown below, for more information please contact us. If you want a modern and stylish van without paying for brand new, look no further than this Swift Challenger. The four berth Challenger 580 features two bench seats to the front, central kitchen, transverse island bed and end wash-room. Externally it has the timberless SMART Plus construction as well as an 80w solar panel, LED side marker lights and rear fixing bars for a bike rack. Internally it has LED lights throughout, new Swift AirWave bedding, gloss upper lockers and the Thatcham approved Tracker Retrieve system (subject to subscription). 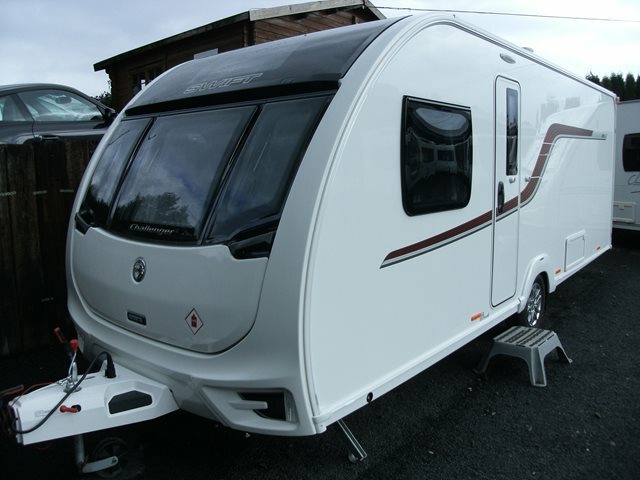 This model includes the optional Alde wet heating, perfect for comfortable all year round caravanning. For any further information please contact us on 01384 413336 and ask for a member of the sales team.